He is an official A&R scout for Hed Kandi/Ministry of sound, he helps to this label to make their compilations, works that all of us are waiting each new season. Ben Santiago is more than a DJ, therefore he is a music worker who can contribute with all his creativity in many different places. For example, he is musical director for Berlin Fashion Week and private exhibitions for Dolce&Gabbana, with his saxophonist Lovely Laura he travels the world from one end to another. He remains living in Ibiza, in his own words, “it’s just the island’s spirit, and my life here it feels like this is my real home” that’s good for us. Ben Santiago is White Island style, O.K., but he knows how to bring us all the Balearic sound , therefore , that rhythms that we made in these islands and now we are giving to the rest of the world. Ben Santiago is an eclectic musician who uses house to unleash all his creativity, one of that persons who are made of energy. Like the best DJ in the world he has some music and just one main idea about playing, it doesn’t matter the type of music, if a track can connect with people in a particular moment he will play it. 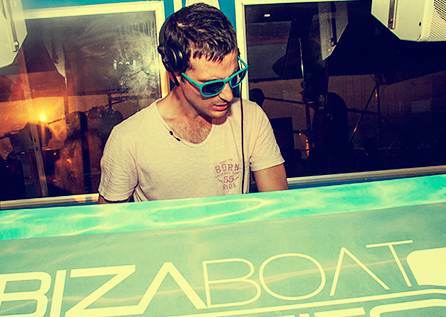 If you want to enjoy with this DJ, just book your tickets now..
We will have Ben Santiago playing in an amazing party in one of our boats in Ibiza, a dream come true with “Float Your Boat”.